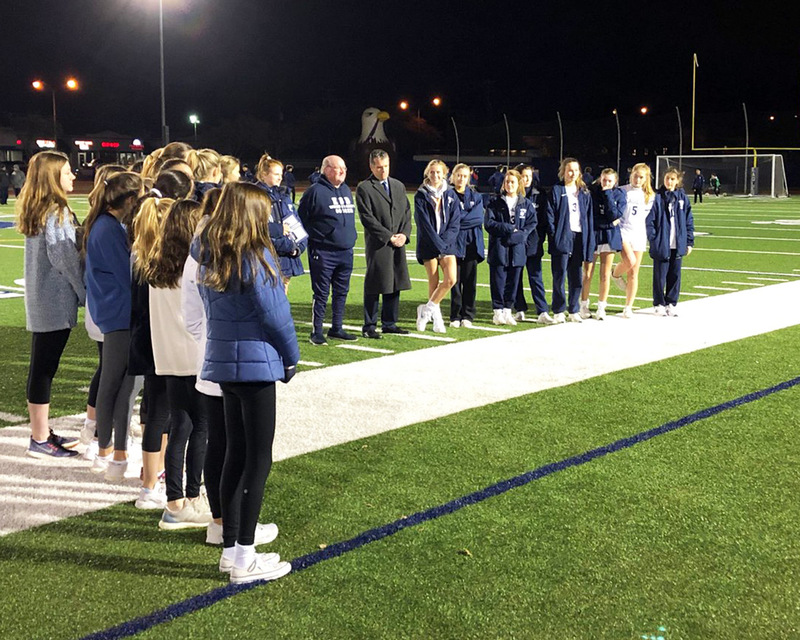 Friday night, Coach Mike Renshaw was honored for his outstanding service to ESD. He began coaching in the Middle School Program in 2009 and announced his retirement following this season earlier this year. Mike was named the head varsity coach in 2012. In seven years under his leadership, the girls' varsity team returned to its championship status, with a winning record in his first season as the head coach, to claiming four straight SPC titles. His teams have amassed over 70 wins, and had 11 players commit to play soccer at the collegiate level. Additionally, he has seen more than 137 goals scored by our Eagles. Equally impressive during this time is the fact that the girls’ varsity team had an amazing streak of 41 consecutive conference games without a loss. Coach Renshaw played professionally for 10 years for Blackpool F.C. in England and the Dallas Tornados in the NASL, and has coached at a variety of levels. He has helped with every level of soccer at ESD, coaching our Eagles at the Lower, Middle, and Upper School throughout his tenure. Many of those players he has coached are in attendance tonight to celebrate his tenure. Coach Renshaw, thank you for your time and effort on behalf ESD’s program. The impact you have made will be remembered and the benchmark for years to come.